Don’t look now, kid, but I think he wants to introduce a foreign substance into your precious bodily fluids. Yes…….just so long as he doesn’t dip his chalk into dye to show her ‘it does get in!’ (Look up Colgate toothpaste commercials with Mrs Marsh. Please don’t judge us) LMAO! “He said my teeth are so yellow when I smile traffic slows down”. “He said my teeth are so rotten I spit Yoo-Hoo”. “He said my teeth are so white they have yellow and brown teeth do their chewing for them”. “He said my teeth are so white they were eligible to attend CPAC this year”. 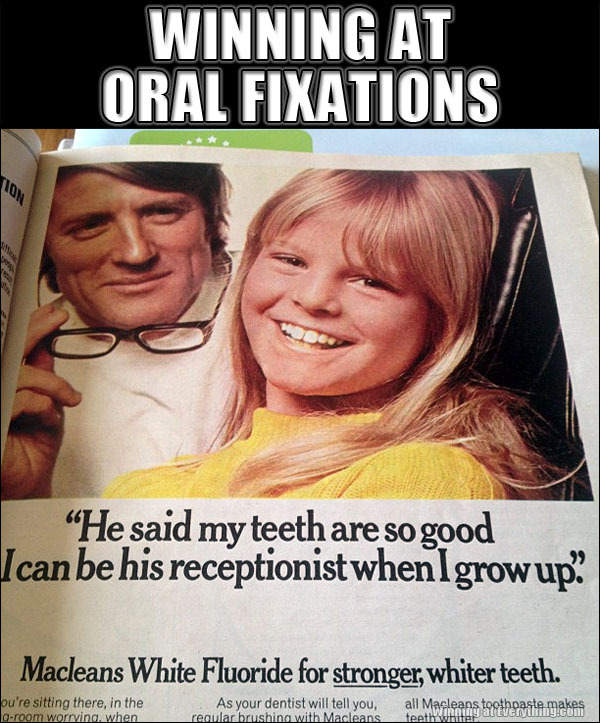 “He said my teeth are so white it forced this magazine to buy better paper so they could run this ad”. He said I have the whitest teeth he ever came across. The comments are creepier than the ad! He says my teeth are so white I can be his receptionist when I grow up because girls can’t be dentists. Of course not! That takes schooling, and girls are stupid. Then why aren’t there more women in Congress?